There have been a lot of nice playsets this year - the Muppets Lab, several of the WOS sets, Sally and the Classroom - but none can come close to the sheer enormity of the most recent WOS release. 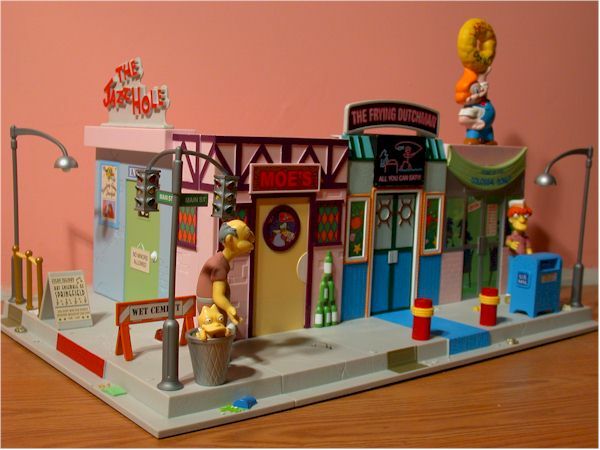 The latest WOS set is Main Street. Playmates tried to get this set produced in 2001, but retailers balked at such a large set at such a large price. Retail is $60 - ouch! But Toys R Us went for it this year, and it's now an exclusive through the stores and their on-line presence at Amazon.com. It's hitting stores in a major way right now, the last of the WOS product for 2002. It's hard to explain just how huge this set is. It's huge. Remember when I said my 6 foot Sully was huge? That kind of huge. The box is designed in a similar fashion to the other TRU exclusives, but about three times bigger at least. It comes disassembled of course, but is fairly easy to put together. This isn't one that lends itself to display in the box however. 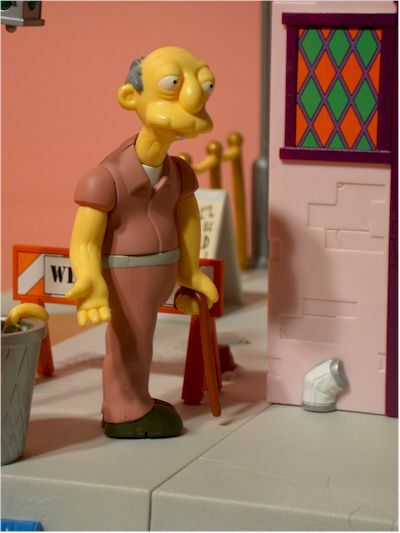 There are two figures included in the set, and neither have an actual name - the Grumpy Old Man, and the Squeeky Voice Teen. 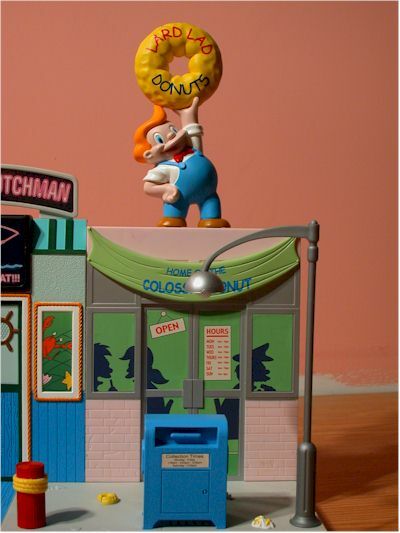 The sculpting on the SVT will be familiar to those that picked up the Krusty Burger, since he's the same as the Pimple Faced Teen. The Crazy Old Man is exceptionally cool, right down to the hunched shoulders and wrinkles in his arms. He goes great with Grampa and Jasper, and actually putting him with them at the retirement castle makes for a better display. But I'm not giving this set four stars on the sculpting for the figures. 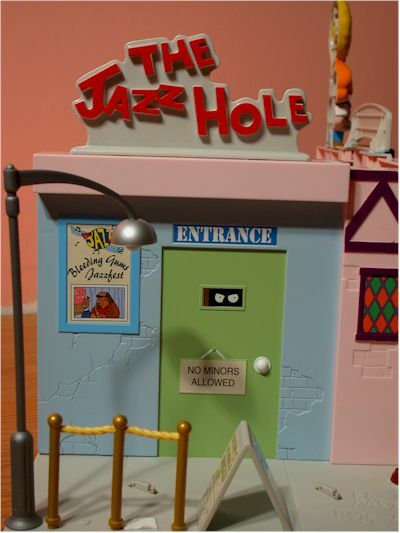 It's because of the excellent details and design of the play set sculpt. The fronts of each of the building have great details, as does the entire sidewalk. There's pop cans, piles of trash, and piles of, uh, some other stuff. 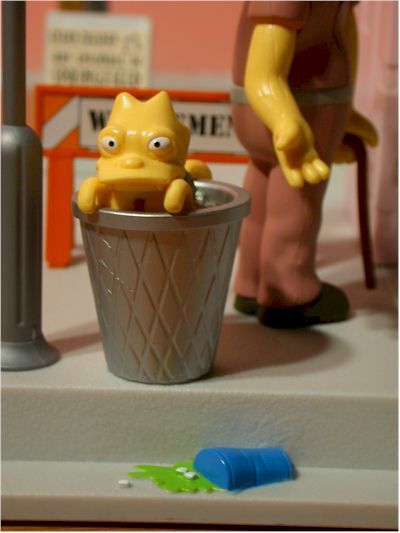 There's even one of Bart's shoes (or at least I assume it's Bart's) stuck in the cement. 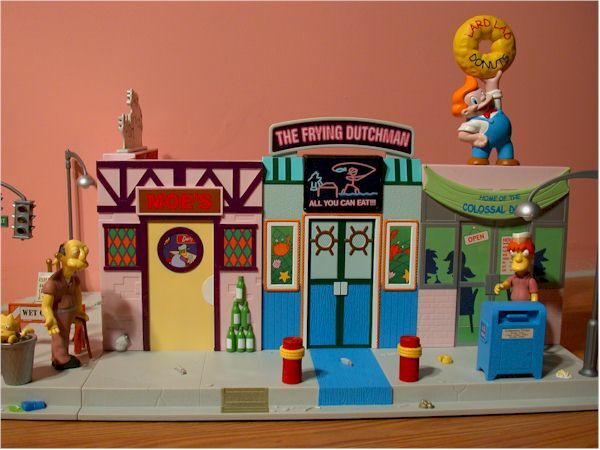 The sculpting on the extra pieces like Snowball in the trash can, the mail box, Lard Lad, and the posts out front of the Frying Dutchman are all excellent, and right in keeping with the style of the show. 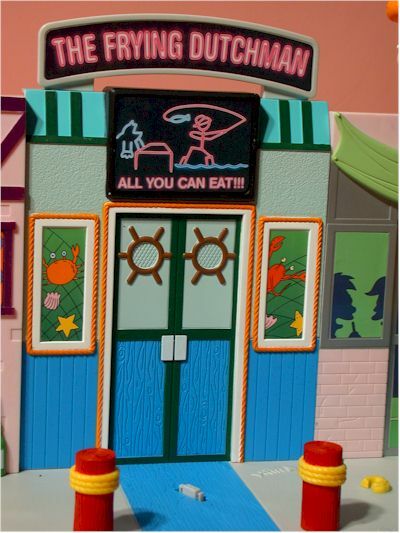 There's also a ton of variety in the sculpt of the store front materials. There's wood slats, rough concrete, large bricks, small bricks, and even wood doors. It's a tremendous amount of surface variety for a play set. The paint is nicely done, although there's not a ton of detail. Both of the figures have very basic outfits, without a lot of color variation, but the paint is fairly clean and consistent. 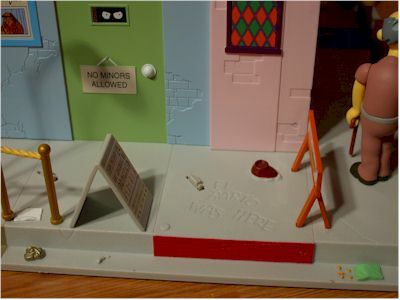 While the figures don't have a lot of detail, the play set itself does, with a variety of paint ops on the small pieces and great work on the big pieces like Lard Lad. The stickers are even more impressive, with lots of cool scenes and extras. 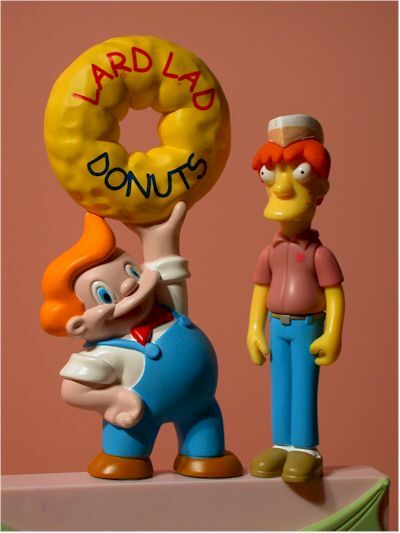 Someone asked if perhaps that's Leela and Fry in the window of the donut shop. I'm not sure, but it might be! It's open to a bit of interpretation, but it's a neat idea. The usual for COM and SVT - neck, shoulders and waist. This category is covering just the accessories for SVT and COM, which are mighty light. COM has his cane (reused) and SVT has his paper hat (reused). At this price point it would have been nice to get one or two more, but I suspect that most of the money went into the extras for the play set. This set is advertised as working with 95 - yep, 95 - different figures. 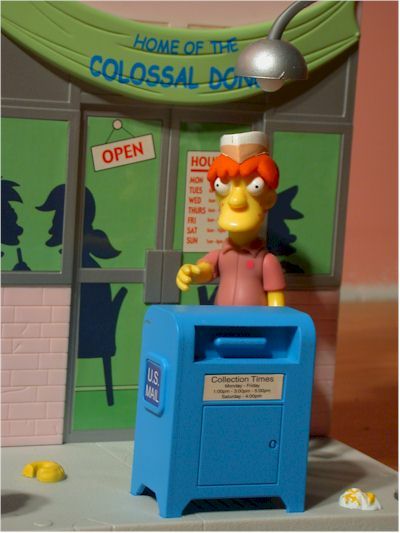 Sure, a lot of that is due to Homer and Bart variations working, but it still is quite impressive. Some of the lines are re-used from other sets, but there are quite a few new ones, and there are characters like Cooder, Bumblebee Man or Frink who have finally gotten some new lines with this set. "My customers are soberin' up, and they ain't gonna stick around for the ambiANCE." and "There's not much future in watchin' you guys drink yourselves into an early grave." There are six foot pets across the set, with plenty of space for other folks to stand around in between. The design of the set is great. Easily the size of four regular play sets if you include going 'round the corner, it includes some of the best store fronts in Springfield. 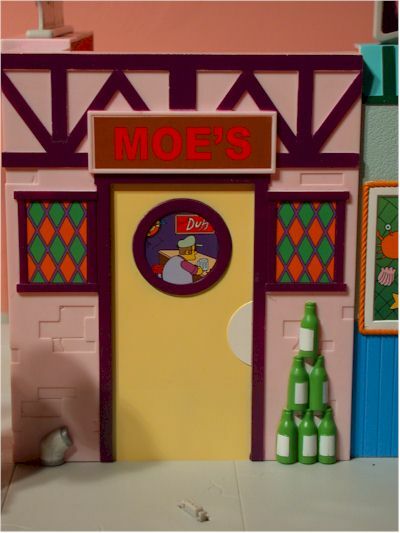 It's particularly nice to get Moe's, even if we are finally getting the interior play set early in 2003. 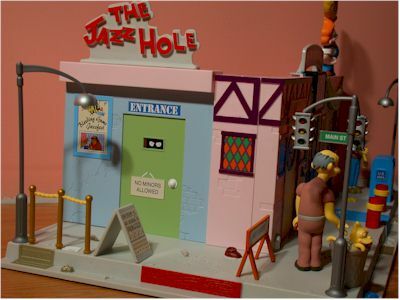 I'm considering all the cool extras in this category as well - the three light poles, the mail box, Snowball in the trash can, the sign and rope fence outside the Jazz Hole, the wet cement sign, and the wooden posts outside of the Frying Dutchman. I'm not calling these accessories, as they are all designed to fit into particular peg holes in specific spots on the set. They all look terrific, and add a tremendous amount of detail to the set. Sixty bucks. That's a lot of money. But this is a lot of play set. There's certainly three play sets worth of plastic here, but we're probably hitting the very top of the price range for something in this line. The price will put off the casual collectors, but don't miss out on one of the nicest play sets in the entire run. I thought the best play set of 2002 category was all wrapped up, and then this big bad boy hit the shelf. While I knew I'd like the set, I had no idea it would be this nice. The only thing holding it back from four stars is the high price tag, a necessary evil with something this impressive. - Amazon.com has them on occasion, as some folks cancel their orders as they find them at the stores. Search for 'simpsons main street'. I've covered a lot of the Simpsons line. Check out this page for a rundown of all the reviews relates to OFF. You should also hit the Search Reviews page in case any other applicable reviews were done after this one was published.